In 1893 Don Augustin Banchero arrived in Buenos Aires, Argentina from Genoa, Italy and opened one of the country’s first pizzerias. The Banchero family, who now have four branches, claim to have invented the fugazza con queso, and this cheese and onion pizza, has since practically become part of the Argentinian staple diet. Fugazzetta is a variation of the popular Argentinian treat, and is very similar to Italian-style. What makes it different? Well, fugazzetta is a double crusted version of fugazza, stuffed with cheese and topped with the same sweet onions and slices of green olives. Fugazzetta de verdura has all of this plus a layer of sautéed spinach and vegetables. Fugazetta is more than a century-old Argentine pizza and it has actually been listed as a food of ‘patrimonial value’ by the Argentine Parliament. The fugazetta reminds me of the pissaladière , a savory caramelized onion tart with black olives, that originated from Nice in Southern France, taking its name from pissala, a pungent anchovy paste that gives the flatbread its distinctive flavor. May I will make that one day and post the results. Traditionally topped with a copious amount of provolone cheese, finely shredded raw onions, green olives, and dusted with a bit of oregano and red pepper flakes, fugazetta is a wondrous creation, that is completely vegetarian. In the bowl of a standing mixer fitted with a dough hook, proof the yeast by combining it with the warm water and sugar. Stir gently to dissolve. Let stand 3 minutes until foam appears. Turn mixer on low and slowly add the flour to the bowl. Dissolve salt in 1 tablespoons of warm water and add it to the mixture. Pour in the olive oil. When the dough starts to come together, increase the speed to medium. Stop the machine periodically to scrape the dough off the hook. Mix until the dough is smooth and elastic, about 10 minutes, adding flour as necessary. Coat a sheet pan with a little olive oil and corn meal. Once the dough is doubled and domed, turn it out onto the counter. Roll and stretch the dough out to an oblong shape about 1/4-inch thick. Lay the flattened dough on the pan and cover with plastic wrap. Let rest for 15 minutes. In the meantime, coat a small saute pan with olive oil, add the onions, and cook over low heat for 30-45 minutes until the onions are deep brown and caramelized. Add a pinch of salt and a few grinds of black pepper, then cook for another few minutes. Preheat oven to 425 degrees F. Uncover the dough. Brush the crust with a bit of olive oil, then Scatter the provolone cheese, caramelized onions, olives, oregano and red pepper flakes over he surface of the dough. Bake on the bottom rack for 10 to 15 minutes. This past Summer, I was stuck on cauliflower and all the wonderful edible things that could be made from it. Through the fall and winter months there are a good number of vegetables and fruit that guarantee a seasonal supply of nutrition. 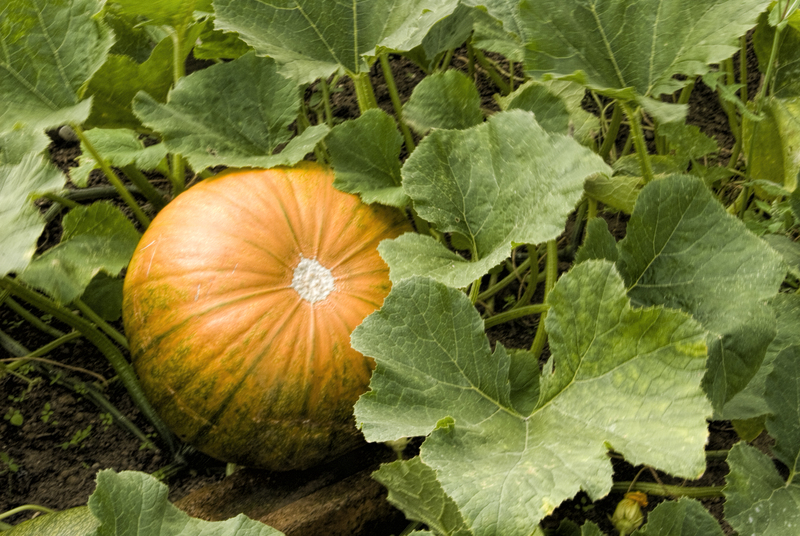 Pumpkin is a particularly good example, capable of being stored for several months. Low in cholesterol and sodium, it is also a good source of vitamins A, B6, C and E, thiamin, niacin, iron, magnesium, phosphorus, potassium, copper and manganese. Just like with any type of food, people tend to fall into two camps when it comes to pumpkin flavored foods; they either love it or hate it. If you are in the ‘love it’ camp then read on. Because I think that you are going to love this Thai inspired recipe that is perfect for the transitional days of Autumn to Winter. To make the red curry paste, simply place all of the ingredients into a blender and process until it turns to a paste. Remove to a non-metallic bowl, cover with plastic wrap and set aside. Place the chopped pumpkin flesh on a baking sheet, sprinkle on the salt and drizzle with half of the olive oil. Put in the pre-heated oven for about 30 minutes or so, until the flesh is soft when pierced with a sharp knife. Remove from the oven and set aside. Heat the remaining 2 tablespoons of olive oil in a Dutch oven or a large saucepan over a medium heat. Add the chopped onion and cook, stirring, for 5 minutes until it is soft and translucent. Add the pumpkin flesh and the red curry paste. Quickly stir to combine and then add the coconut milk and the vegetable stock.Bring the contents of the pan to a gentle simmer, lower the heat and cover the pan. Cook for another 10 minutes, stirring occasionally, then remove from the heat and allow it to cool for a another 10 minutes. Put the soup into a blender, doing so in several batches and process until smooth. Return the blended soup back to the Dutch oven or stock pot and reheat gently, simmering, and NOT boiling. Serve the hot soup in bowls, garnished with the chopped cilantro. 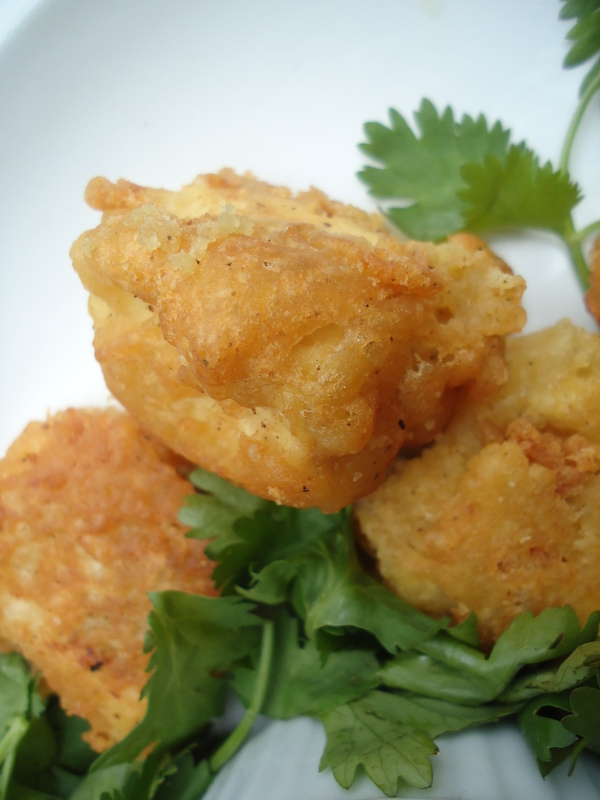 These seasoned fried tofu nuggets make a great vegetarian option for the more popular chicken nuggets. Dipped in a seasoned batter and pan fried to a crisp golden brown, these nuggets are known to convert tofu haters into lovers.Unlike chicken, making a baked version of this dish is not easy or recommended. There is so much moisture the tofu holds that frying at a relatively high heat quickly gives the batter its nice crispy golden texture. If the tofu sits out too long, the batter becomes wet due to the liquid within the tofu. So enjoy them while they are warm. 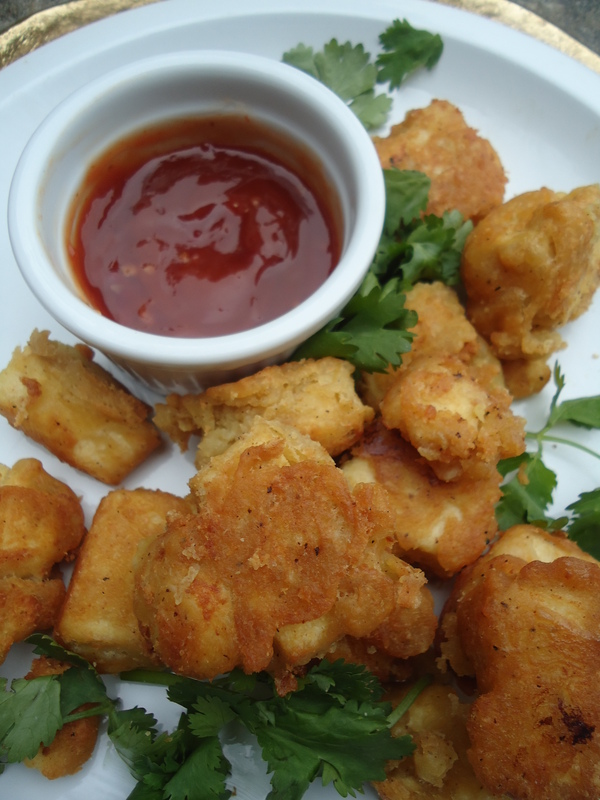 These seasoned tofu nuggets are irresistibly good and will make tofu haters into lovers. Enjoy! Place the block of tofu on top of a flat strainer and place a flat plate over the top of the tofu. Then place a heavy pot on top of the plate. This will allow the tofu to expel as much water as possible. Allow the tofu to drain for 1 hour. Cut the tofu into rough, 2-inch cubes. In a medium bowl, stir in the flour, baking powder, baking soda, yeast, dissolved bullion, garlic powder, salt, five spice powder paprika and black pepper.Slowly add the water, whisking as you go. The mixture should be the consistency of pancake batter. Pour 1/3-inch level of oil into a medium pan. Heat the oil on medium heat. Working in small batches, generously coat the tofu cubes with the seasoned batter. Without overcrowding the pan, fry the bottom of the tofu until the batter turns to a crispy golden brown. Flip the cubes and cook until the rest of the tofu cubes are crispy and golden brown. Place finished cubes on a plate lined with a paper towel. Continue to do this until all the cubes have been fried. The tofu will be very hot. Allow the tofu to cool for five minutes. Serve with your choice of condiment and enjoy while warm and crisp.